When Fast racks are full, they can be stacked for storage or transportation. Grab an empty beer box and slide it on, and the result is a fully organized dry box of empty bottles. The holes allow for easier use and the inside of the bottles do not make contact with anything, making sanitation a breeze. 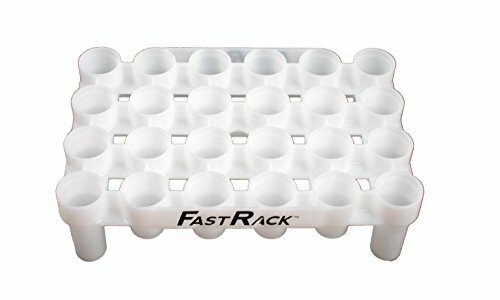 RACK & STACK: Several full FastRack bottle drying racks can be stacked on top of each other up to 5 high for convenient storage inside the FastRack bottle tray. The more you stack, the more secure it gets! Try doing THAT with a typical bottle drying tree!